Arizona is famous for its hot, arid, rugged climate. The temperature gets up there (it is often above 100 degrees), but it is a far cry from the sizzling humidity that plagues colleges and universities on the Atlantic Coast. And there are plenty of places in the state that offer college students that are outdoor buffs an opportunity to enjoy colder temperatures and more varied terrain, students can cross-country ski in the north of the state, raft the Colorado River or explore spas and visual arts in Sedona while attending a public college in Arizona. There are microbreweries, Southwest food festivals, prickly pear margaritas, and dance clubs from country western to hip-hop. In fact, when it comes to the great outdoors, Arizona has its share of national parks; perfect weekend distractions for students of all types. Over all, the Arizona economy was built on the footing of cotton, mining, agriculture and ranching. Today, the state has added many sectors in aviation/aerospace, health care, tourism and technology. Looking for an Arizona Public College? Arizona has nearly 140 accredited postsecondary institutions; colleges, universities, and technical schools; both big and small, urban and rural. This includes three public universities - Arizona State University, Northern Arizona University and the University of Arizona - and 21 community college districts. here is a wide variety of subjects taught at these institutions. The Arizona Board of Regents is the governing board for the state's public universities: Arizona State University, Northern Arizona University, and the University of Arizona. The Board provides policy guidance in such areas as: academic and student affairs; financial and human resource programs; student tuition, fees, and financial aid programs; university capital development plans; strategic plans; legal affairs; and public and constituent outreach. Funding programs generally require that colleges meet specific quality standards, as determined by regional or national accrediting agencies. The North Central Association of Colleges and Schools is the main regional organization for accreditation in Arizona. However, certain colleges and degree programs may receive accreditation from specialized entities. The state's public universities are located in the three largest urban centers in the state, Phoenix, Tucson and Flagstaff. 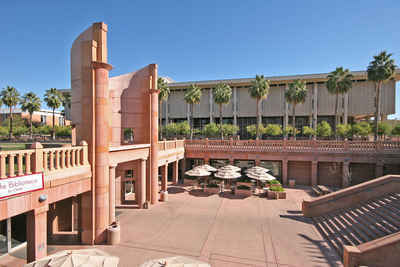 Arizona State University, the most popular, with an enrolment of over 72,000, is the largest public university by enrollment in the United States. University of Arizona is the most expensive public school in Arizona with an in-state tuition of $9,952. Both major public Arizona colleges: Arizona State University, Downtown Phoenix and the University of Arizona have received honors, with a spot on US News and World Report's list of Best Colleges in the Southwest. If you're looking at continuing education and want to consider an online college degree program, consider the online colleges you can find in the state of Arizona. Earning another degree or continuing your education, keeps you competitive in today's job market. Earn your degree today.